Episode 83 of KWOW took a close look at Kim Jong-Un, his brothers and his notable nephew Kim Han-Sol. But what about the other relatives? 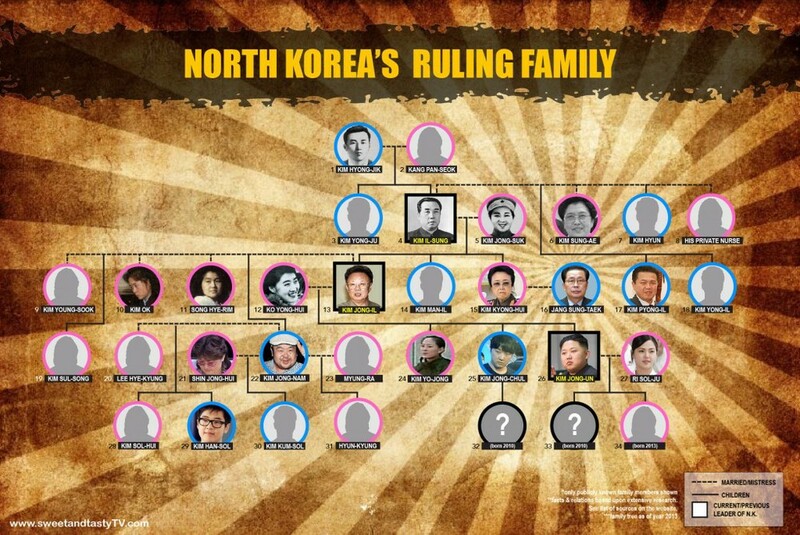 North Korea’s ruling family and their history seems more like a television series than reality. Mistresses, sibling rivalry, lavish lifestyles, kidnapped celebrities, mysterious deaths, rags to riches, and vice versa, the Kim family has got it all. What is shared here is only a small handful of eccentric, juicy details. 1. Great-grandfather of Kim Jong-Un, Kim Hyong-Jik (1884-1926) was a teacher and herbal pharmacist. He was also a Korean independence activist and Communist politician. 2. Like her husband, Kang Pan-Seok (1892-1932) was a Korean independence activist during the Japanese occupation. 3. Once his brother Kim Il-Sung’s likely successor, Kim Yong-Ju (1920-) went under house arrest in 1975 due to increasing power struggle with Kim Jong-Il. In 1993 he served as North Korea’s powerless vice president. 5. First wife of Kim Il-Sung, Kim Jong-Suk (1919-1949) was idolized as the nation’s “Female General.” Born to poor farmers and orphaned at an early age, she became a Communist activist and is said to have saved Kim Il-Sung’s life at gunpoint. They married thereafter. She died at the age of 29. Tuberculosis? During childbirth? Shot and bled to death? The official cause of her death remains a mystery. Kim Jong Il's family portrait. From left to right (top to bottom): Sung Hye Rang (Kim Jong Il's sister-in-law), Lee NAm Ok (Sung Hye Rang's daughter), Lee Il Nam (Sung Hye Rang's son), Kim Jong Il, and Kim Jong Nam. 6. Upon the death of his first wife, Kim Il-Sung married Kim Sung-Ae (1928-?) during the Korean War. She was vice-chairwoman of the Central Committee of the Korean Women’s Association in the 1960s, then promoted to chairwoman in the 1970s. 7. According to Lee Il-Nam (the nephew of Song Hye-Rim), the former leader Kim Il-Sung had an illegitimate son with his private nurse. The son was named Kim-Hyun and born in 1971, the same birth year as Kim Jong-Nam. Kim-Hyun’s existence remains a secret to the North Korean people and may have been executed under Kim Jong-Il’s order in 2001. To learn more about this mystery man, read the article "The Life and Execution of Kim Hyun." 8. Little is known about Kim Jong-Il’s private nurse. Read #7 for details on their hidden son Kim-Hyun. 9. Kim Il-Sung chose Kim Young-Sook (1947-), the daughter of a high-ranking military official, to marry his son Kim Jong-Il. Though the couple was estranged years before Kim Jong-Il’s death, Kim Young-Sook remained his official first wife. 10. Said to be Kim Jong-Il’s fourth wife, Kim Ok (1964-) served as his personal secretary until his death. Rumor has it she had a daughter with him. Kim Ok was a classically trained pianist. 11. Famed North Korean actress Song Hye-Rim (1937-2002) was once Kim Jong-Il’s mistress. Regardless she was five years older than he and divorced with a daughter, they lived together in secret. Suffering from mental illness and frightened by Kim Jong-Il’s temper, she later flew to Moscow for treatment. She is buried in the Troyekurovskoye cemetery, a mere 10 meters away from Stalin’s son Vasily Dzhugashvili. Her former best friend published “I Am Song Hye-Rim’s Friend,” a memoir of traumatic events she endured after she discovered Song Hye-Rim and Kim Jong-Il’s clandestine relationship. Kim Il Sung's family portrait. From left to right: Kim Jong Il (Kim Il Sung's son), Kim Il Sung, and Kim Jong Suk (Kim Il Sung's first wife). 14. Kim Jong-Il’s younger brother Kim Man-Il (1944-1948) was drowned in their mansion’s pool. Some speculate the then five-year-old Kim Jong-Il was responsible for the accident. 15. It’s reported that Kim Jong-Il asked his trusted sister Kim Kyong-Hui (1946-) and her husband to be senior advisors to his son Kim Jong-Un. Kim Kyong-Hui is called the “Lady Macbeth of Korea.” She operates the one and only burger shop in Pyongyang. 16. North Korean politician Jang Sung-Taek (1946-) escorted Kim Jong-Nam when he attended school in Switzerland. He serves as Vice-Chairman of the National Defense Commission and is Kim Jong-Un’s key policy advisor. 17. Kim Pyong-Il (1954-) could’ve been North Korea’s leader in place of his half-brother Kim Jong-Il. However in his early years, Kim Pyong-Il hosted parties where guests would chant “Long Live Kim Pyong-Il!” His rivalrous brother Kim Jong-Il relayed this information to their father Kim Il-Sung, who was North Korea's leader at the time. To wish longevity of anyone other than the leader was considered blasphemy. Ever since the incident Kim Pyong-Il has been in exile for thirty years and counting. He is viewed as a continued threat to the North Korean government simply for resembling his father. Rarely making public appearances, Kim Pyong-Il is currently the ambassador of North Korea to Poland. He married a former opera singer and has one son and one daughter. 18. Kim Jong-Il’s younger half-brother Kim Yong-Il (1955-2000) was a former counsel of North Korea’s Embassy in Germany. He once was an engineer, working in North Korea’s nuclear program. 19. Kim Jong-Il’s beloved daughter Kim Sul-Song (1974-) was in charge of her father’s security and schedule. A North Korean defector described her to be tall, beautiful and smart with waist-long hair, an uncommon trait of North Korean women. 20. Second wife of Kim Jong-Nam, Lee Hye-Kyung once performed with the Chosun Performing Arts Troupe and went by the name “Jang Gil Sun.” It is said she lives in Macau. 21. First wife of Kim Jong-Nam, Shin Jong-Hui (1971-) reportedly lives on the northern suburbs of Beijing. They say she is raising her husband's third wife's daughter Hyun-Kyung. 22. Kim Jong-Il’s oldest son Kim Jong-Nam (1971-) almost inherited North Korea’s current leadership. However lost his father’s favor upon being caught sneaking into Japan with a fake passport. He corresponded with journalists, publicly voicing his not-so-encouraging opinions of his half-brother Kim Jong-Un. Interestingly the two never met before. Kim Jong-Nam’s mistress So Yong-La was once a Air Koryo flight attendant. 23. Third wife of Kim Jong-Nam, Myung-Ra is said to be living in Macau. Her family name remains unknown at this time. 24. Youngest daughter of Kim Jong-Il, Kim Yo-Jong (1987-) became a frequent member of her father’s entourage and now serves as her brother Kim Jong-Un’s assistant. 25. Kim Jong-Un’s older brother Kim Jong-Chul (1981-) was deemed too feminine to rule the country. He was caught with a woman wearing a similar ring as he, but whether they are married remains a mystery. Brothers of a North Korean leader are traditionally exiled, but Kim Jong-Chul is free to live in North Korea and to travel outside the country. Watch KWOW episode 83 for more details on Kim Jong-Nam. 26. Kim Jong-Un (1983-) is North Korea’s current leader. His exact age is unknown as his birth year may have been revised for political reasons. While North Korean leaders have a history of concealing their wives and mistresses, Kim Jong-Un has already revealed his wife to the public. His relationship to the media is more open in comparison to his father. 27. Kim Jong-Un’s wife Ri Sol-Ju (1984-) is identified as “Hyon Song-Wol,” a famed singer in the Unhasu Orchestra. To create an ideal image of the first wife, the government is trying to delete her past by confiscating bootleg CDs of her performances. Ri Sol-Ju once studied in China and attended a sports competition in South Korea. Her father is a university professor and her mother leads a gynecology unit at a hospital. 28. There is little known about Kim Han Sol’s sister Kim Sol-Hui (1999-). 30. Kim Kum-Sol (1997-) is Kim Han-Sol's half-brother who lives in China. 31. Myung-Ra’s daughter Hyun-Kyung is reported to be living with Kim Jong-Nam’s first wife. 32. The name and gender of Kim Jong-Chul’s first child is unknown. 33. Kim Jong-Un's first child was born in the same year as the child of his older brother Kim Jong-Chul. The name and gender is unknown. 34. Thanks to Dennis Rodman leaking out a state secret, we are informed that Kim Jong-Un’s second child was born in 2013. The name is unknown, but we know it’s a girl! “Kim Jong-il 's Sons 'Had Kids Last Year'"
“Where Is Kim Jong-il's Eldest Son?"